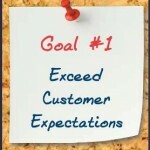 Meeting customer expectations plays a major role in experience. The gap between expected and actual value that customers get is key to customer loyalty. It also influences propensity to spend and brand perception. Creating experiences that generate more value than competitor offerings helps to create unforgettable memories. 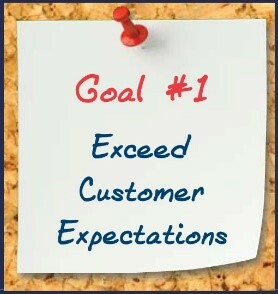 But, to meet customer expectations, businesses must first understand what their customers expect. Bristan established a cross functional team. It aims to deliver goods to customers at the right time, price, place, quantity, and quality. This team represents the end-to-end customer experience. Senior staff from each department contribute and deliver initiatives to improve performance. Using customer feedback, they found many opportunities to improve customer experience. For example, they launched the Easy Fit tap range in 2012. These taps are a solution for customers who faced having to hire installers to fit their taps. Customers can fit them from above the basin, without having to go underneath. Also, they have added many more ‘how to’ videos on their company website. These give customers the capability to self-serve. To date these videos have more than 100,000 views. Business Environment offer serviced offices. They survey all customers via an online portal each quarter. They ask what customer experience they believe they are receiving, and what they want. In summer 2012, Business Environment created the industry’s first Service Excellence Guarantee (SEG). It sets out exactly the standards of service which customers could expect. It contains exact and specific benchmarks, from extensive customer consultation. It’s more than a piece of marketing. The SEG includes employee training and reviews, and a quarterly survey. “Ninety-eight per cent of customers say we are better than competitors”. They research the latest industry trends by attending fashion previews and fashion shows. They hold advance briefings with suppliers and fashion designers to discuss next season predictions. Avios send valuable members complimentary Lonely Planet guides as thanks for their loyalty. This “Surprise & Delight” activity exceeded expectations with increased member engagement. They got positive feedback from members via social media as well as a 30% increase in sales. Hungry Horse use customer data from various sources to deliver differentiated service from competitors. Their mystery guest programme measures delivery against their service standards along the customer journey. It shows if they are meeting customer expectations and needs and how to improve.